Create your own custom printed nursery bedding decor with our new handsewn and fitted custom crib sheet! Constructed from 100% jersey knit polyester, our crib sheet is breathable, durable, and machine-washable -- perfect for new baby! 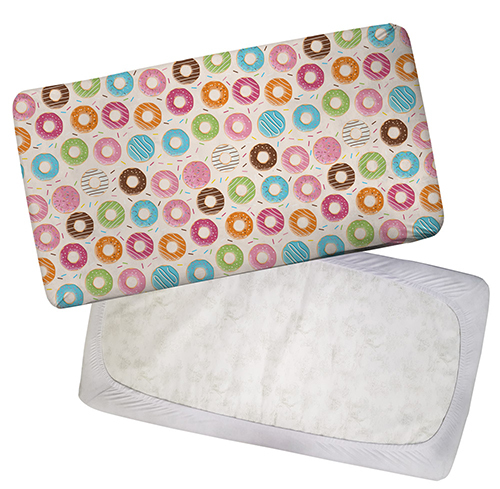 Crib sheet features a reinforced elastic fitted lining and deep pockets to fit a standard 28" x 52" crib mattress. Custom print the fabric edge-to-edge with any design, text, or graphics for a stunning and uniquely beautiful crib sheet you can't find anywhere. Create a matching nursery set with our printed crib sheet, minky baby lovey, and baby blanket for the perfect receiving gift set for new parents!